Entering the Musée du Louvre gives you the chance to come face to face with some of the greatest works of art in the world. 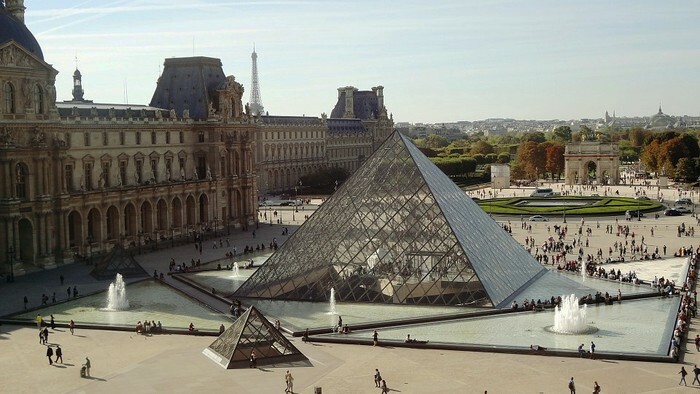 The Musée du Louvre has over 380,000 artworks, but only 35,000 are on display to the public. Its permanent collection is divided into 11 sections, running from the ancient empires of the Middle East to the middle of the 19th century. If you’re looking for French Impressionism or contemporary art, though, you need to head over to the Musée d’Orsay or the Centre Pompidou. You should think carefully about what you want to see before you start your visit and plan your way around in keeping with how much time you have. It’s a good idea to get hold of a map of the museum to see exactly where its most famous pieces are on display. You can download a PDF map from the official website. • Seated Scribe (2480–2350 BC). This piece by an unknown sculptor is one of the most representative statues of Ancient Egypt. • Code of Hammurabi (1750 BC). A basalt column raised by King Hammurabi of Babylonia with engravings of one of the oldest preserved set of laws in the world. • Venus de Milo (110 BC). One of the best-known works of Ancient Greek sculpture. Sculpted in white marble, it encapsulates the ideal of classical beauty. • Winged Victory of Samothrace (190 BC). A magnificent Greek sculpture of Nike, goddess of victory. • Mona Lisa (1502–06). This painting by Leonardo da Vinci is the jewel in the Louver’s crown. However, the crowds around this very small work of art make it hard to get a good look. • The Wedding at Cana (1563). This colourful oil painting by Italian painter Paolo Veronese fills this biblical scene with thousands of tiny details. • The Lacemaker (1669). One of the most famous paintings by Dutch painter Johannes Vermeer . • Liberty Leading the People (1830). This famous oil painting by Eugène Delacroix shows the people of Paris rising up to defend their freedoms. • The Turkish Bath (1862–63). This painting by Jean-Auguste-Dominique Ingres is seen as one of the precursors to modern painting. The Louvre is open from 9.00 am to 6 pm every day of the week except Tuesday, when it is closed all day. However, it stays open until 9.45 pm on Wednesday and Friday. The best time to visit is first thing in the morning. You’ll still have to queue, but the lines only get longer and longer as the day goes on. You’ll also be able to make your way around the museum more easily. A ticket to the Louvre costs €15 for adults. Admission is free for under-18s. There are concessions for students and pensioners . You can buy tickets online or at the ticket office. The main ticket office is in the glass pyramid. Once you’ve got your ticket, you’ll have to queue to get into the museum, passing through the hall with the information stands, shops and other ticket offices. The trick is to go straight to the hall and buy your tickets there. You can also make your way directly to the main entrance by buying your tickets beforehand or buying a Paris Museum Pass.